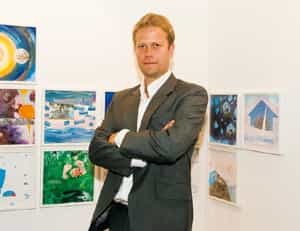 New Delhi: Anders Petterson, founder and managing director of the UK-based art market research company ArtTactic, is in the city to attend the four-day India Art Summit 2009, which started on Wednesday. With a background in financial analysis, Petterson founded ArtTactic in 2001, responding to increasing interest in art market research and commentary. Petterson and his team use analytical frameworks similar to those used by financial markets to present statistical data for art markets in order to enable prudent investment. His presence at the second edition of the India Art Summit is not surprising, given India’s growing presence in the global art market. To reflect the country’s increasing clout as an emerging art market, ArtTactic also publishes regular country-specific reports for the Indian contemporary art market. ArtTactic’s Artist’s Survival Rating is a tool to gauge long-term credibility for artists. The rating captures the long-term (10-year) belief that an artist will be of high, medium or low importance. In the ‘high’ category of the three-tiered Indian Survival Rating launched in May, Subodh Gupta measures 72%, with Atul Dodiya following a close second with 65% and Rashid Rana at 43%. Others in the list are N.S. Harsha (37%), Jitish Kallat (37%), Ravinder Reddy (36%), Bharti Kher (35%), Surendran Nair (34%), Sudarshan Shetty (28%) and Anju Dodiya (22%). ArtTactic’s April 2009 reports show that the overall Indian Art Market Confidence Indicator fell by 63% since the last reading in October 2008. However, in the secondary art market, the round of June auctions confirmed an encouraging trend in the contemporary Indian art market. The ArtTactic Indian Auction Indicators saw a reversal in the negative trend that started in December 2006. For instance, the average auction price index indicator for contemporary Indian art increased from $18,000 (Rs8.76 lakh) to $21,000 between March and June. This indicates that despite the meteoric rise and the subsequent large fall in the Indian art market, there is still room for continued growth. How does ArtTactic work in the qualitative element in art market analysis? All our statistics are generated by combining qualitative and quantitative research tools. Apart from following sales and market figures for quantitative data, we survey a set of art experts every six months for the qualitative aspects. Who do the art experts comprise? We survey tastemakers in the art world—art dealers, buyers, curators, art historians, commercial and non-commercial enterprises—basically, anyone who has a stake in the art market. We have a sample of about 90 experts. We’re not trying to be democratic, but instead, we’re trying to represent a relevant sample of entities who move the art world. What does ArtTactic do to ensure that the projected statistics are interpreted accurately? That is a huge concern for us. Statistics are prone to both intentional and unintentional misinterpretation and we conduct monthly seminars and talks in the UK to educate our clients. India, being a young art market, it is firstly important to educate our clients about the way that the art market works itself. Statistical interpretation is the second leg. We do plan to extend our educational programme to venues outside the UK eventually. Does ArtTactic provide bespoke services? Do you have Indian clients for those yet? (Bespoke is a term used for custom-made products or services). We do custom research for individual collectors, dealers, art funds, private banks and government agencies. Since art market statistics is in itself a relatively new concept in India, we do not have bespoke clients in India yet. But we know that will change soon.